“A story should be big enough to fit into a sprint, otherwise chop it up until it does” — this is advice that is more or less given to Scrum teams during planning or backlog grooming. The problem is that this is not easy to do. My friends at Growing Agile describe a few ways to achieve this (see their blog post Breaking Down User Stories). These techniques are not wrong in any particular way, and they will certainly result in smaller stories. However, these are what I call “mechanized” techniques. When I’ve been mechanical about splitting stories, I’ve always ended up with weak fracture points in the problem space. So, I prefer to look in the solution space for boundaries that promote or retain conceptual integrity of the software. Below are just three techniques that are quite commonly used by Scrum teams. I steer away from them at all costs. existence that maintains integrity is quite an effort. Dependent Stories. I try to break all dependencies between stories. I’ve found that looking to create “stand-alone” stories results in some very deep and powerful analysis of the domain. Inadvertently, you will crack open a crucial part of the domain. Often the concept which holds several stories together in sequence turns out to be orthogonal to the original stories. For example, there is a workflow for invoices (issue, authorise, pay, remind, resend, etc) that can result in several dependent stories. Alternatively, we can model the invoice state (and operations allowed for each state) independent of the sequence(s) of states. Now we can build software that deals with specific sequences, independently of the operations for each state. This separation can lead to such powerful discussions with the domain expert. functions (or any other weak boundary criteria). There are significant consequences to splitting stories in the solution space. The product owner just needs a simple phrase or sentence that describes the problem space, but remains part of the feedback loop for the solution space stories. Backlog grooming becomes an exercise in understanding the problem space. Sprint planning blitzes (one day or less) is not sufficient. … and you will tend towards continuous flow. Accurate estimation is not an oxymoron. Let’s just get over some technicalities first: “accurate” is not the same as “exact”. Estimation in software is never exact, but the magnitude of accuracy is very significant. If I say that something will take approximately 2 weeks to achieve, then I need to qualify “approximately”. What is the magnitude hidden behind “approximately”? Is it 10% accurate, 50% accurate, 80% accurate? Let’s say it is 50% accurate. This means that I can finish this work at best in 1 week or worst 3 weeks. That’s a big swing. As a good developer, it has to be better than 50%. If it’s 50% or less, then it is an indicator that you are lacking understanding (i.e. knowledge) in a key part of the problem and/or solution domain. Then you have to estimate on what it will take to overcome that ignorance, before committing to the original request. An estimate is not a commitment. If you mix these two concepts together, then you most likely will be in trouble sooner than later. The estimate is based on something that you understand and that you can foresee with good accuracy. In other words, an estimate is a prediction of the future. The commitment is a promise that you make on part of the estimate in order to make that prediction come true. If I predict that a problem can be solved in 3 days, then I may make a promise for some part of it by the end of the first day. This distinction may surprise some who have been using the poker game, or other estimation technique in Scrum. Scrum teams use estimates in planning make commitments for the entire sprint, then track and calibrate velocity via burndowns, which leads me to the next point. Team velocity or relative estimation does not make for better estimation. Knowing what a team’s velocity is based on tracking historical trends is only a measure of the energy the team has expended to date. 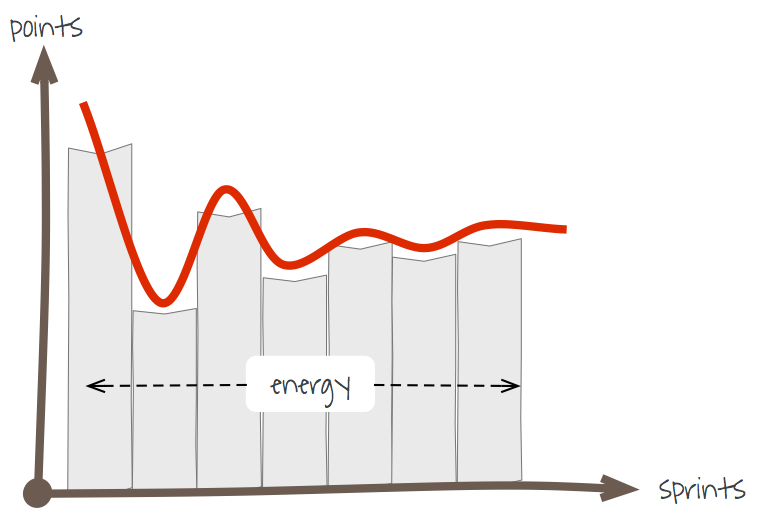 This expended energy (the area under the curve) is used to predict the potential energy of a team. That’s all, nothing more nor less. I will stick my neck out and go so far as to say that relative estimation in points is not at all about estimating, but a way to accurately predict the potential energy of a team. I’ll go even further: relative sizing does not work because software development is about crunching new knowledge, and every new piece of work should be crunching more knowledge. If it’s the same thing over again, then the design is flawed or at least at the wrong level of abstraction. Jumping levels of abstraction, and re-shaping designs takes quite a lot of knowledge crunching and is not relative to anything else but your existing knowledge. So, relative estimation does not make for better estimations and velocity just tells you the potential energy of the team. Where does this leave me? I’ve given up on relative sizing and estimation. Knowing my own velocity has not added any value to my ability to estimate because every problem is unique in some way. I estimate based on the knowledge that I have at that point in time, and force myself to be aware of my accuracy. All of this, and more, has made me appreciate the value of one piece flow a lot more than time boxed flow.